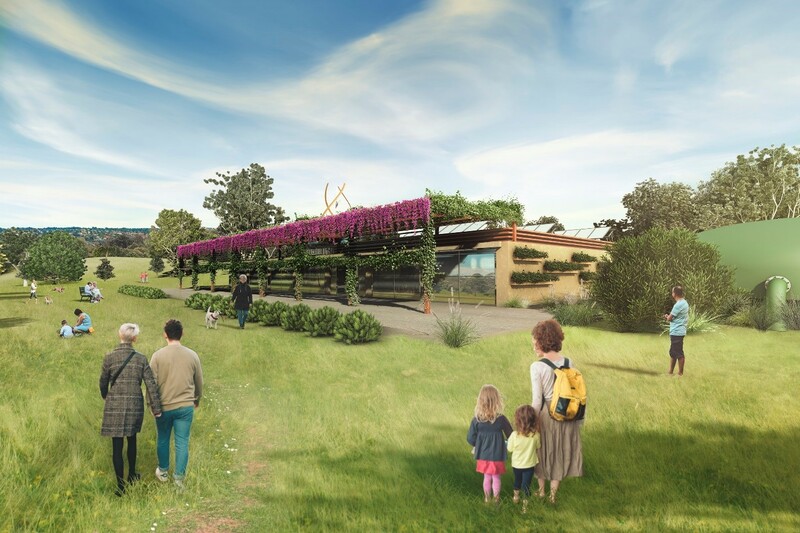 The following information relates to the first stage of the Doncaster Hill Recycled Water Project, in which Yarra Valley Water engaged people in the community to find the best location to build a treatment plant. This stage of the project was completed in late 2017. Get the latest project information here. To produce enough recycled water to supply the Doncaster Hill area, Yarra Valley Water must build a treatment plant somewhere nearby. While we understand the technical aspects of what would be a suitable location for a treatment plant, we also need to understand the views and opinions of people in the community about each of the potential treatment plant locations. We are engaging people in the community to find out what they think is the best site for a treatment plant to provide recycled water to over 5,000 new properties being developed in the Doncaster Hill area, in and around the Westfield Doncaster shopping centre. We want to understand the views and opinions of as many people as possible in the community about each of the potential treatment plant locations. We have established a three-person Independent Panel, chaired by Rob Gell, to be available to meet with people during three weeks of community deliberation, commencing Monday 11 September at the Manningham Civic Centre at 699 Doncaster Road, Doncaster. Following the period of community deliberation, the Panel will take time to reflect, and will provide a report to Yarra Valley Water about what they have heard, as well as a recommendation about where the treatment plant should be located. Yarra Valley Water will consider this report and recommendation before deciding where to locate the treatment plant. This decision will be announced and communicated to people in the community in late 2017. These sessions will be your opportunity to meet with the Panel, offer your ideas and comments, raise issues, and generally provide your feedback on site options. ** Childcare and language translator services (Mandarin, Cantonese and Greek) will be available for these sessions. Please register in advance for childcare services on 9872 2696 (during business hours) or email [email protected]. The treatment plant’s location and operation will need to meet strict planning and environmental regulations, including for aspects such as noise or odours. Where vegetation is impacted, this would be replaced and improved in consultation with the local community. We will also consider proximity to houses, environmental and Aboriginal and European cultural heritage values, ongoing monthly access for maintenance and delivery vehicles, access to the nearest sewer and water mains, and the cost to build. Right now, we’re focused on identifying the most suitable location for the treatment plant. We don't have a preferred location. When the time comes to design and build the treatment plant, we will work with people in the community on what it could look like, and to identify possible community benefits that could be delivered by having a drought proof source of water available at this location. The following fact sheet contains site-specific information about Doncaster Park & Ride, Eram Park, Frank Sedgman Reserve, Ruffey Lake Park and Tram Road Reserve, as well as a map showing the locations of the possible sites and the mandated Doncaster Hill recycled water area. Other sites were assessed during the site shortlisting process. Want to know more? Below, we seek to answer some of the more common questions about the Doncaster Hill Recycled Water Project. Yarra Valley Water is owned by the State Government of Victoria. Our activities are overseen by an independent Board of Directors appointed by the State Government. We provide essential water and sanitation services to more than 1.8 million people and over 50,000 businesses in the northern and eastern suburbs of Melbourne. We also build and maintain the pipes and infrastructure required to provide these services. Environmental stewardship is another of our responsibilities – to manage our water supply in sustainable ways - in balance with the environment and to provide our customers with quality water – for now and into the future. We know from talking with our customers and from research we do, that a lot of people don’t think about water being a finite resource – that we don’t have an endless supply. Besides Antarctica, Australia is the driest continent on Earth. Population growth is increasing the demand on water supplies in our cities and towns, and climate change is making our climate and rainfall more unpredictable. Long term stream flows within Melbourne’s water catchments are forecast to significantly reduce by up to 50% by 2065. Ensuring we have enough water means we need to change the way we think about, and use water. To meet this challenge, the State Government has put in place a new strategy based on wide community input that is now guiding the way we do this across our state. It’s called Water for Victoria. The strategy has actions for all levels of government and water authorities like Yarra Valley Water. An example of one action is for water authorities to increase the use of recycled water in long term water planning. Visit www.delwp.vic.gov.au for a copy of this water strategy. One of the opportunities we’ve identified to increase the use of recycled water in our service district is in Doncaster Hill, an urban redevelopment area in the City of Manningham. This is known as the Doncaster Hill Recycled Water Project. This project will provide recycled water to over 5,000 properties (some completed and others currently under construction) in the Doncaster Hill precinct, and to the nearby Tullamore development (formerly the Eastern Golf Course). The Doncaster Hill precinct is a mixed use sustainable urban village covering 58 hectares centred on the intersection of Doncaster and Williamsons/Tram roads in Doncaster, surrounding the Westfield Doncaster shopping centre. Manningham City Council, the planning authority for this area, has developed a 20-year strategy to construct over 5,000 new residential apartments and attract five million extra visitors a year to the precinct. The nearby Tullamore development is also being designed to be a sustainable living precinct. The recycled water that will be supplied to the area will be able to be used for flushing toilets, washing clothes, watering gardens and car washing. How much drinking water would be saved? By using recycled water for flushing toilets, washing clothes, watering gardens and car washing, we can reduce drinking water use by up to 25%. This is a saving of approximately 2.5 million litres every week. To give you an idea of how much water that is, an average-sized bath tub holds roughly 80 litres of water so that is equivalent to 26,250 baths per week. Recycled water - what is it and how will we do it? Recycled water is water from sewerage systems or industrial manufacturing processes that is treated to a ‘fit for purpose’ standard for a specific use. This type of water is not suitable for drinking but it is ideal for flushing toilets, washing clothes, watering gardens and car washing. It’s known as ‘Class A’ water which is the highest quality of recycled water available in Melbourne. Class A water is increasingly being supplied to all new homes being constructed in the northern part of Yarra Valley Water’s service district and in many other new housing developments in the urban growth areas of Melbourne and around Australia. The Class A water that will be produced for Doncaster Hill is the same standard. This water is also frequently used across Victoria and the rest of the country for agricultural use such as growing vegetables and other crops. Is recycled water safe to use? Class A recycled water is safe for its intended uses. The recycled water supply is continuously monitored and checked to assure its quality. This is a compliance requirement of the Environment Protection Authority Victoria (EPA) and the Department of Health and Human Services (DHHS), the regulators of recycled water use. Where will this recycled water come from and how will it be treated? Sewage will be pumped out of a large sewer in the area, a process commonly known as ‘sewer mining’. It will then be treated to a Class A standard and stored in tanks ready for use. The sewage will be treated using a combination of techniques. It will be filtered first to remove large objects like cotton buds and other rubbish. Chemicals and bacteria will further treat the sewage before it will be finally disinfected using ultra violet light to kill any harmful bacteria. This kind of treatment is a reliable and proven method to treat sewage. How do the properties get the treated water? A specially constructed pipeline will transfer the water to the properties. They have been plumbed with an extra pipe (known as a ‘third pipe’ and purple in colour), to be able to take this recycled water and to keep it separate from drinking water pipes. The treatment plant site will consist of a building that will contain pumps to take sewage from the sewer, and tanks to hold and treat it. There will also be other pumps at the site that will pump the treated water to households. Outside the building, there will a tank to store the treated water prior to its delivery via an underground pipe to the properties at Doncaster Hill. Smaller tanks would store the chemicals required to treat the sewage and clean equipment. The treatment plant will also need a vertical pipe (known as a vent stack) with an odour treatment system inside it to filter out and clean any gases from the treatment process before they are released into the air. These types of vent stacks are usually approximately 15 metres high. To ensure any nearby residents or businesses are not affected by the plant’s operations, the location and design of the treatment plant will have to meet strict planning and environmental requirements. We will need a Council Planning Permit and a Works Approval from the EPA. The EPA will not approve the proposed treatment plant unless its design meets strict environmental requirements, specifically odour and noise. What are the gases that will require treatment? Sewers contain gases. Some examples are hydrogen sulphide (commonly known as ‘rotten egg’ gas), ammonia, methane, carbon monoxide and nitrogen oxides. The gases form in the sewer from the breakdown of the sewage. They will need to be treated to meet all limits set by the EPA to ensure the treatment plant doesn’t release odours and for the safety of people who operate and maintain these facilities. What kinds of chemicals are used to treat the sewage? Aluminium sulphate – a coagulant that attracts and binds small particles to form a larger mass that is easier to filter out of the water. As well as treating the sewage, these chemicals will also be used for cleaning equipment. None of these chemicals is flammable and would be in a liquid form contained in a dedicated closed storage area. In the unlikely event of a leak, these storages are housed within another tank to prevent spills to the environment. How big will the treatment plant be? The amount of land space usually required for this kind of facility is approximately 2,400 square metres. It’s about five times the size of a basketball court. The treatment plant building itself will be up to 6.5 metres high, and about the size of a traditional house block (750 square metres). What are the impacts of putting something like this in a built-up area? We’ll construct the building to fit in with the surrounding area. There will also be people visiting the site on an ongoing basis for maintenance and chemical deliveries. The building will be sound-proofed to stop any noise being audible outside and it will be well-sealed to ensure any odours from the treatment process can be properly treated within the building. Is it necessary to have a treatment plant in a built up suburban area? We need to be able to supply recycled water at a reasonable cost and so it will need to be in close proximity to the area being serviced. The major sewage treatment plants in Melbourne are located at Bangholme and Werribee, a long way from Yarra Valley Water’s area of operation. Pumping recycled water back from these locations to Yarra Valley Water’s area would be extremely expensive and would produce much more greenhouse gases (a key contributor to climate change) compared to producing the recycled water locally. Are there any examples of these kinds of treatment plants elsewhere? Several recent office developments in Melbourne that have smaller scale treatment plants in their basements. This kind of technology is also used for watering golf courses, for example City West Water operates a treatment plant at Sunshine Golf Course. An underground treatment plant using the same technology as proposed for Doncaster Hill is now working in Yarra Park near the Melbourne Cricket Ground. This is operated by the Melbourne Cricket Club. There are other examples of these kinds of treatment plants of varying sizes around Victoria and in other states. Can’t you use water from the desalination plant? The desalination plant can supply up to 150 billion litres of water per year - about one third of Melbourne’s annual water consumption. The State Government’s Water Plan Water for Victoria stresses the importance in a drying climate of not being reliant on one source of water – to ensure we have a diverse and cost effective range of water sources for the future. The Doncaster Hill Recycled Water Project provides one of those alternative water sources. Why don’t you use stormwater? Stormwater is water harvested from rainfall. As our rainfall becomes more unpredictable because of climate change, there is a risk that a continuous supply of water from this source may not always be possible. If this were to happen we would need to top up the supplies with drinking water, placing extra and avoidable demand on our drinking water supply. Stormwater also requires a treatment plant plus a large area of land to provide a storage tank to harvest the water during rain events. This adds extra cost and the requirement for extra land. Sewage is a more reliable source. 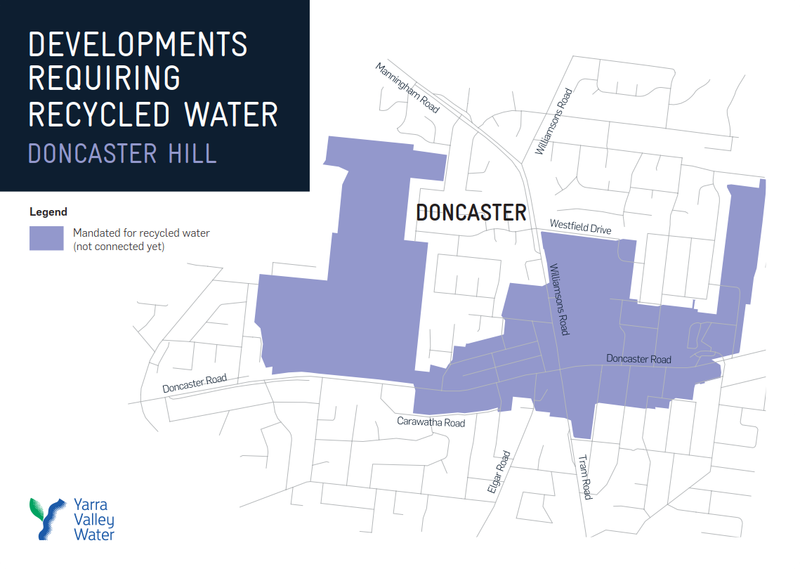 Ninety-five (95%) per cent of sewage is water and this means that a reliable and continuous supply of recycled water would be available to service the Doncaster Hill area. Haven’t you tried to do this before? Yes. In 2012 we consulted with people in the Doncaster area about a proposed site for a treatment plant at Tram Road Reserve in Doncaster. We submitted a planning permit application to Manningham City Council and a Works Approval application to the EPA. The EPA issued a Works Approval but the council ultimately rejected our planning permit application so we decided at that time to defer the project. We learned that people were not opposed to the idea of introducing recycled water to the area but had clear views about where a treatment plant should not be located. We have since been considering alternative options and have several we would like to consult people about. We have engaged an independent expert panel to conduct a deliberative engagement process for us. This will involve presenting five possible sites, each with their own specific attributes, for people to consider and provide their views about the most suitable location. Over three weeks in September 2017, the panel members will meet with people to hear their ideas and feedback, and to discuss opportunities at each possible treatment plant location. The Panel will then review the feedback, and will provide a report for Yarra Valley Water about what they have heard, as well as a recommendation about where the treatment plant could be located. Does Yarra Valley Water have a view about the best place to put a treatment plant like this? Infrastructure for our essential services - water, gas and electricity - is located throughout our community – under roads, in nature strips, in road reserves, in pipe tracks, through private and commercial properties and in public open space. We want to work with people in the local community to find an acceptable location that will also enable the treatment plant to be able to operate effectively. 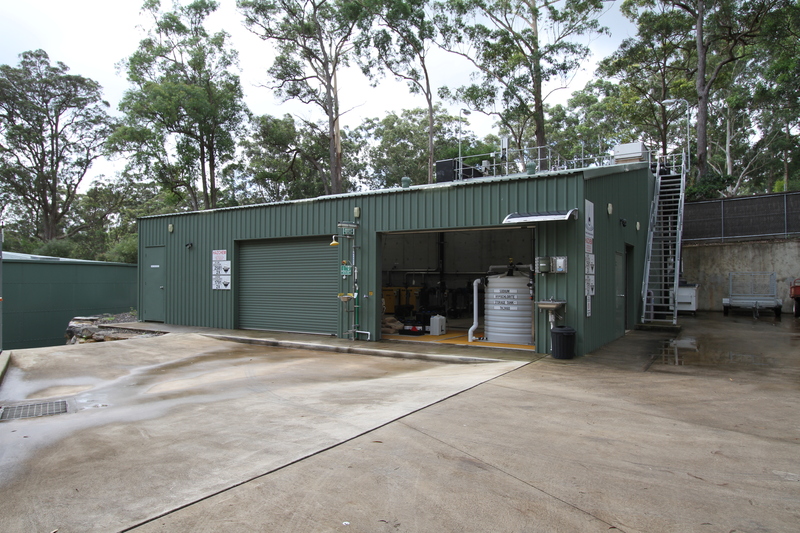 These kinds of localised treatment plants work best being close to the area they will service. We know that finding suitable locations for some new infrastructure, particularly larger facilities that require a bit of land can be more challenging, particularly in highly urbanised areas. What the current and future use of the land is. We’ve provided these examples to give you an idea of how they look and how they have been designed to fit into the local surrounds. They show quite different options – something that is quite architecturally prominent, and others that blend in with the surrounds. This treatment plant produces more than 180 million litres of recycled water each year, reducing the Melbourne Cricket Club’s use of drinking water by 50 per cent. 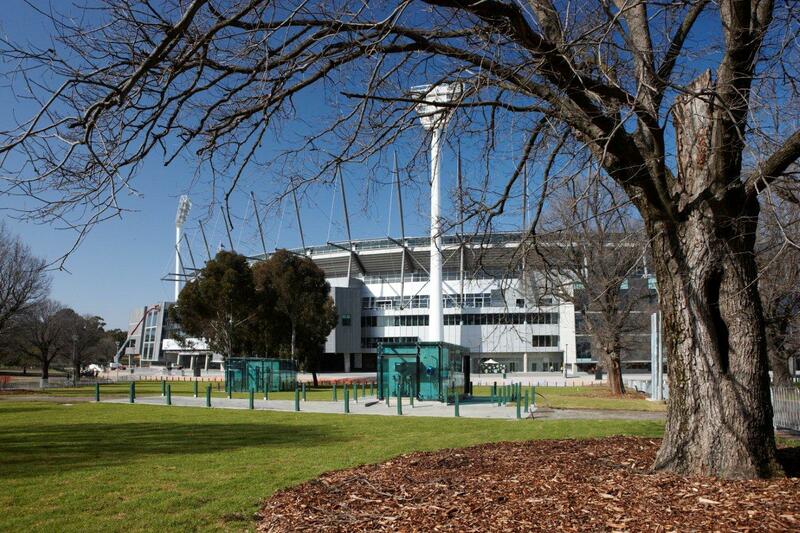 The water is primarily re-used as irrigation in Yarra Park, as well as for cleaning and toilet flushing at the Melbourne Cricket Ground and at nearby Punt Road Oval. 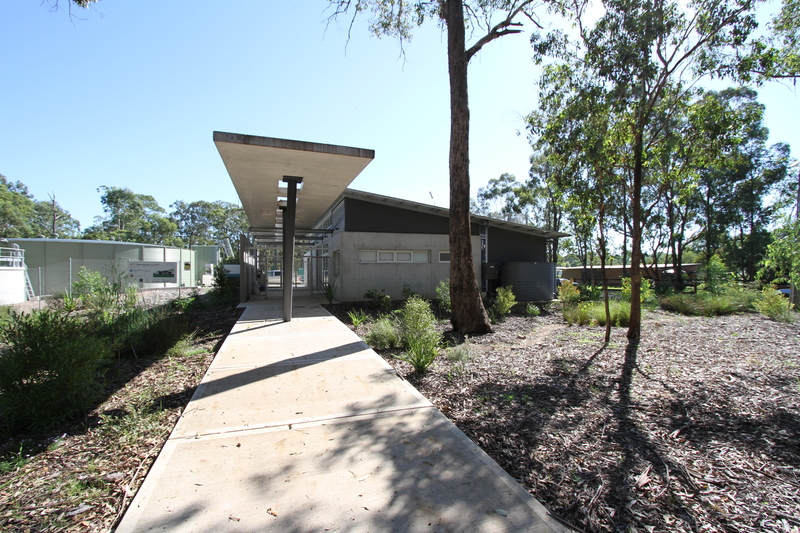 As one of the first of its type in Victoria, the treatment plant has been built underground. This local treatment plant provides a drought-proof source of irrigation water for the golf course, has ensured the future of this 90-year-old business, and has secured a large area of green space. Extensive stakeholder consultation was undertaken during the design process to ensure the needs of local residents and golf course users were incorporated into the construction and operation of the treatment plant. A local treatment plant supplies recycled water to a new residential development via a third pipe. Recycled water is used for irrigation, toilet flushing and washing machines. The new treatment plant is adjacent to existing residential development. We see an opportunity to design a treatment plant that is harmonious with the landscape, and will add benefit to the local community. This is an artist’s impression to give you an idea of what a treatment plant could look like once constructed. We expect construction of the infrastructure required (buildings, tanks and pipes, etc.) will cost around $28 million, depending on its location. The additional direct costs to provide recycled water will be recovered through a combination of developer contributions and ongoing charges for customers across our service area. The Essential Services Commission (ESC) regulates what we can charge. Will this impact on my water bill? There will be no increase in customer bills. Based on the long-term growth of the precinct, an overall reduction of $0.20 will be derived in all customer bills after allowing for the costs of the scheme. Is this why my water bill has increased? No. Recent increases in water bills, have been primarily due to the ongoing funding of Melbourne’s desalination plant. Decisions about the value, needs and merits of these kinds of projects are made by relevant government organisations (state and local) on behalf of the wider community. While the need for such projects may be widely recognised and broadly supported by the people in the wider community, the process for finding a suitable location for a particular facility needs to be undertaken with care and respect for the specific community in which the facility might be located. Our commitment is to have as broader and more inclusive conversation with people as we can, to enable us to make the best decision possible - one that is broadly supported by most people. If there hasn’t been recycled water delivered to the apartments by now, what has been delivered and how? If recycled water is unavailable, we supply drinking water. Why didn’t you build the treatment plant before the apartments were built? The timing of when to build infrastructure like this is when the actual demand exists – that is, when there are enough properties constructed that would be able to receive the recycled water. As the area will be progressively be developed over the next 20 years and for maximum economic efficiency the treatment plant needs to be completed in the next few years. To provide the necessary certainty for developers about plumbing requirements, Yarra Valley Water mandated the area as a recycled water area. This was done to provide clear expectations for developers about constructing buildings with the right plumbing. Are there plans to expand the treatment plant in the future? The facility will be designed for the current expected demand from the Doncaster Hill precinct. We will size the plant to meet the third pipe demand of the expected growth within the Doncaster activity centre. Third pipe schemes being developed in other dense infill areas in Melbourne like the La Trobe and Monash National Employment and Innovation Clusters would have their own local treatment plants. When will the treatment plant be built? If we find a site that people tell us is acceptable we would then do the necessary design work and seek the required council and EPA approvals. Typically, the time it takes to plan, design, construct and commission a facility could take at least three years. How long will construction take? Will there be disruptions to surrounding properties during construction? Once we have found a site we expect that any construction works involved would take approximately 18 months. We will work with any nearby residents or businesses to minimise the impact, but some disruption may be unavoidable. The main disruption will be from construction noise and increased construction traffic and depending on the final site there may need to be some road closures as we construct the pipelines to service the properties. Will there be staff permanently on site? No. The treatment plant will be remotely monitored 24 hours per day, but staff will need to visit the site daily. There will also be monthly chemical deliveries which will require truck access. Will the treatment plant affect property values? An independent certified property valuer has advised us that if the treatment plant is designed to be unobtrusive, is appropriately screened and can’t be heard or smelt from adjoining properties, then it will be unlikely to have an adverse impact on property values. Can other homes in the area get recycled water too? It is not economically feasible to retrofit plumbing and supply pipelines to existing single properties. With the delivery of recycled water via a separate pipe third pipe, the cost of providing recycled water to existing homes would be prohibitive because it would require retrofitting extra pipes. It is more cost effective to include the right plumbing at the time of building new subdivisions like what is being undertaken in the Doncaster Hill precinct when the right pipes can be installed as the apartments and homes are being built. Because each address within the Doncaster Hill area is being developed with multi storey apartments, and the extra internal plumbing is installed at the time of construction, it is economically justified to install new pipelines to supply the recycled water to these apartment blocks. In the meantime, you can contact our project team during business hours on 9872 2696 or email [email protected]. The time to provide feedback to the Panel about where the treatment plant should be located has now passed. Following their review of the feedback they received, the Panel has released their Report which includes their recommended site for a treatment plant. View the Panel Report, and get the latest project information.